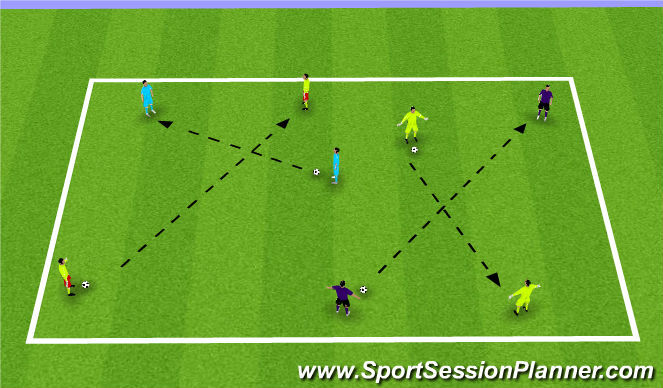 Players in groups of 2 passing in moving in open unrestricted space. 3. Can they perform them now in a longer range pass. Set Up: 25x20 grid with small goals on end line. Description: Blue team always starts the attack in a 1v1 situation. 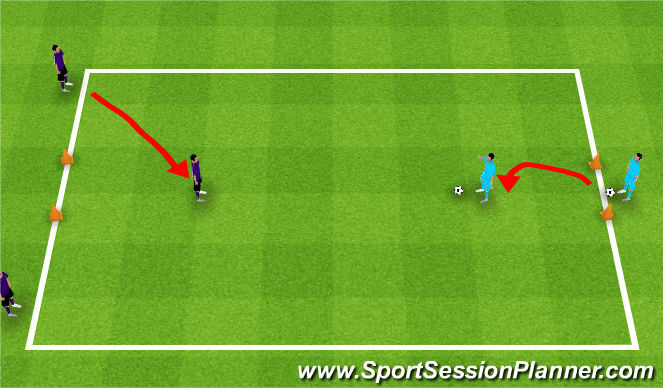 If the purple player wins the ball then a second purple player can get on to counter to opposite goal making in 2v1. Go for time limit switch roles, can make several grids to get more players involved. Set up: 25x20y grid with goals in the corner of the grid to allow each team a scoring opportunity. Players will be organized in a 2 v 2 situation. The purple team would be defending and not allowing the team to penetrate and beat them and if win the ball can counter attack. Encourage creativity in the dribble, recognize when to dribble, shoot, or pass. When a team scores they stay on and defend the next 2 attackers coming on, the 2 that got scored on go off, the next 2 come on with a ball. If ball goes out of bounds 2 new players come on from each side. Quick transition to attack. 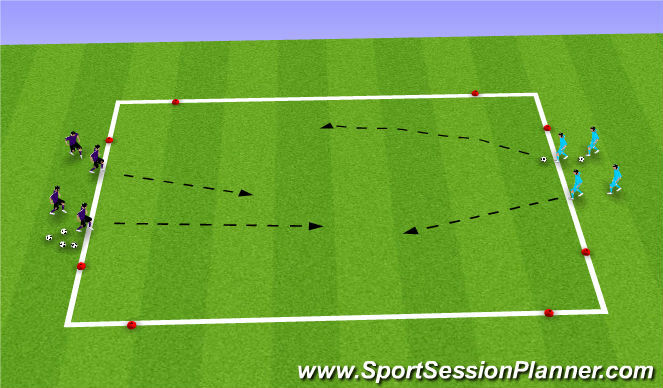 6. passing short or long range with multiple surfaces. Progression: Have a neutral player that comes in from both teams to work on that players movement. As above 20x30 grid 2 small goals, goals must be scored on the ground. The yellow team can use the outside players in a 4v2 situation. If the purple team wins the ball they counter in a 2v2 situation. Switch roles after a set time. Team in possesion must go to outside player before they can score. Add touch limit for outside players, to increase movement off the ball. Free play encourage player to counter attack in counter attacking situations.